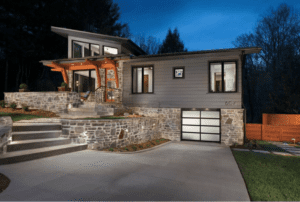 Laura and Sean Sullivan decided to put Living Stone Construction’s design-and-build process to the test when they renovated their home in Black Mountain. Sean, owner of Living Stone, and Laura, owner of ID.ology Interior Design, wanted to see how well their in-house process works for the many clients the award-winning team attracts. They bought an older home in a venerable neighborhood and treated themselves as clients. Through work that raised the roof and added square footage in back, the Sullivans confirmed that Living Stone’s meticulously thought-out process makes renovating an existing home or building a new one as easy for clients as possible. The experience reinforced the company’s position that the more time a homeowner spends with Living Stone in the design and selection phases, the happier he or she is. Living Stone has created a seamless process that lets homeowners be as involved as they want. For their own home, the Sullivans renovated an older house in an established neighborhood in Black Mountain, not far from their company’s Craftsman-style office. The house, built a few decades ago, needed significant updating, both inside and out. Part of the challenge for Sean and Laura was to raise its profile without upstaging its neighbors. Using the warmth of wood and the reassurance of rock, the Sullivans created a home that Laura calls “organic contemporary,” a thoroughly modern look that doesn’t have the hard edges and cold steeliness of extreme contemporary. The renovation fits in with the neighborhood perfectly, she said. They ended up with three-bedroom, three-bathroom house of about 2,300 square feet. With a media room, wine cellar and Laura’s art studio, the house is just the right size for the two of them, as well as their son when he comes home from college. “Right-sized” is a term Living Stone uses often to help clients get the most house for their money. It’s a term Sean uses especially to help them understand the challenges of building in the mountains. “We work with clients to select every material and finish and design every detail, from the exterior to the interior to the roofing and hardware,” Laura said. It’s a process that the Sullivans have seen proven time after time. Laura explains by way of example. For a second, she and Sean thought about painting over the walls with a different color. Like some of their clients who second-guessed their choices once the paint goes up, the Sullivans had some fleeting doubts. But they held steady, as Sean advises his homeowners to do. He recalled the experiences of one client who spent tens of thousands of dollars to repaint, only to be disappointed that they hadn’t stayed with their original selections. Trust is one of the cornerstones upon which Living Stone Construction was founded. It’s integral to the design-and-build process, because building a house in the mountains is perhaps a bigger undertaking than it is on flatter land. Living Stone accompanies prospective clients to the lots they are considering buying to help them with choices that ensure they get the most house for the money, one that best complements the kind of lives they want to live. Where a house is positioned on a lot has a great deal to do with how its owners enjoy and use it, Sean believes. Submitting themselves to the Living Stone process helped the Sullivans tweak it so that it better serves their clients. It helped them empathize when there are inevitable delays (“they’re frustrating,” Sean said, “but building a home is like delivering a baby”). But renovating their Black Mountain home the Living Stone way proved to them that the process works. All of the homes that Living Stone builds are Energy Star, green-built, aging-in-place houses. Aging in place, or universal design, means a home is built in such a way that its owners can stay there far into their lives. It means main-level living, wider doorways, curbless showers, extra lighting and lever handles, among other features. “From the start, we’re going to build the home so that the homeowner can stay there as long as possible,” Sean, a certified aging-in-place specialist, said. Their home project allowed them to undertake something Living Stone loves and excels at – “infill” development. Placing a home in a vacant lot of an existing neighborhood – or renovating one already there, as opposed to knocking it down to build another – maintains the integrity and history of a neighborhood, something that is dear to the Sullivans’ hearts. “Instead of tearing houses down, I’d rather bring new life to them,” Sean said. Living Stone specializes in the kind of renovation he and Laura undertook for their own home, in part because it’s what many people want these days. Increasingly, people want to live in or near cities and towns. Urban lots are expensive, making renovations of existing structures more attractive. And if they chose to build, many are opting for lots in established neighborhoods like the Sullivans’. “We absolutely love our home,” Laura said.